From piano bars to dance clubs, there are many options for enjoying some evening fun in California. Whether you’re looking for a sophisticated wine bar or just a beer and a game of pool, the chances are pretty good there’s a perfect California nightlife location for you. All you have to do is figure out what you’re looking for! Do you enjoy live music? Larger cities and college towns usually have current events newspapers available for free inside restaurants and/or from streetside kiosks where you can find out what bands are playing and where during your visit. You might even find some money-saving tips for exploring California nightlife there, too! Even smaller towns often have live music offerings, especially on weekends, so just ask around. Would you rather have a few laughs at a comedy club? There are many historic ones in California where now-famous comedians got their start. In southern California, you might want to check out The Comedy Store locations in San Diego and West Hollywood or the Improv in Los Angeles. In Northern California, there’s also an Improv in San Jose and San Francisco has a comedy club called Punchline. Is a rooftop view of a city’s twinkling lights your idea of the perfect way to enjoy California nightlife? It’s hard to beat Bertrand at Mr. A’s or the Hard Rock’s Rooftop Pool, both in San Diego’s famous Gaslamp district. If you’re in Los Angeles, Windows at the Transamerica Center offers a great ambience for enjoying the view while sipping on one of the 150 different kinds of martinis. In San Francisco, the Carnelian Room in the Bank of America Building offers the city’s highest public view, and as a bonus you can see if you recognize the room from the Dirty Harry movie! Drink prices typically range from around $4 to $10 at bars and clubs in California (although they can be appreciably more expensive in some high-end locations), and cigarette smoking is forbidden by state law in any bar, restaurant, hotel lobby or public area of any kind. 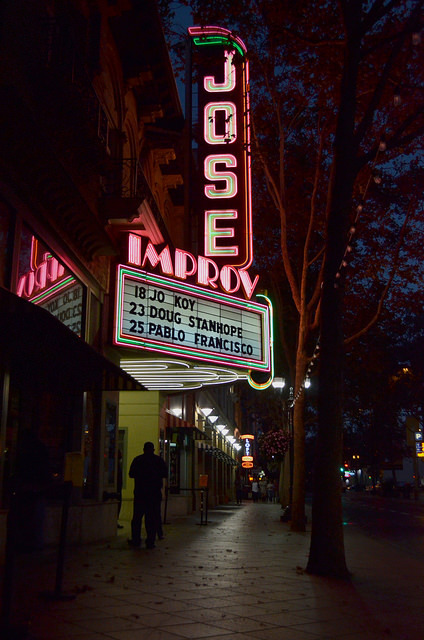 Photo of San Jose Improv Comedy Club by Pablo Francisco via flickr (Creative Commons).